In the old days there were many carriages that people would ride on the Bac Ha Plateau, with horses pulling them. A man who lives up there decided it would be a good idea to bring these carriages back, especially for tourists to ride. So, he went to China and bought a carriage. Now he has a business taking tourists for carriage rides. Hoofing it: Hoang Van Chu provides the region's only horse-drawn carriage service. A horseman, deeply attached to the northern mountainous Lao Cai province's Bac Ha Plateau, has expressed his love for the area as he carries tourists in a horse-drawn carriage. 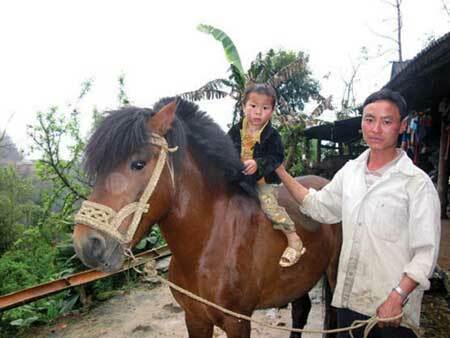 Hoang Van Chu of the Nung ethnic group, who lives in the province's Na Hoi Nung Village of Na Hoi Commune, is the first admirer of the 'White Plateau' to build a horse carriage and earn his living by transporting tourists in the carriage. "It's easy for tourists to find a vehicle to travel everywhere on the Plateau, as there are modern vehicles in the area, including motorbikes and minibuses. However, anyone who is well-experienced in travelling will choose the horse carriage," Chu said. A carriage ride with a view of the imposing mountain landscape gives tourists the impression of being on vacation and makes them feel a bit like "royalty". Travelling the Bac Ha Plateau, tourists will be impressed with the colourful ethnic costumes, the horses' neighs, and the screams of mountain pigs intermingled with the sounds of hammers on the fires of blacksmiths. In particular, tourists will have the opportunity to enjoy Tam Hoa plums, a tasty specialty of the area. "Many tourists visiting the plateau shared with me that travelling by horse carriage helped them leisurely enjoy the area's landscape and take souvenir photos," Chu said. He is skilful at shooting and horse straddling and a famed horseman in the area, having learnt how to ride a horse and fire a gun in early childhood. "My parents told me there were many horse carriages in my hometown during the years of French colonialism, from 1857 to 1945. At that time, the horse carriage was one of the specific features of Bac Ha Plateau. Local residents mostly used horses for transport. Only the rich could ride in carriages," Chu said. However, such kinds of vehicles gradually fell into oblivion, and were changed over to modern vehicles. "There were no horse carriages on any roads in the area since the 1990s," Chu said. The sound 'click clock click clock' of horses' hooves and the tinkling of the tintinnabula bells on their necks gradually faded in local residents' memories, which saddened the horseman Chu. After much searching of his heart, Chu decided to go to China and order a horse-drawn carriage from a Chinese worker, with the aim of bringing back a specific tradition of the plateau. "The Chinese man delivered a horse carriage on time. Yet, the carriage he made couldn't satisfy me because it was not convenient for carrying tourists," Chu said. Not giving up, Chu was determined to make a horse carriage on his own. The vehicle was completed and used to serve tourists in the area, which surprised all local residents. "Some of my neighbours sneered at me, and called me a ‘madman'. They thought that there would be no tourist to use a horse carriage on their trips. Yet, I ignored all the ridicule and continued making shoes and tintinnabula for my horse," Chu said. At first, Chu carried tourists free of charge along the most beautiful destinations in the area, such as Hoang A Tuong edifice, Trung Do Temple and on misty paths, in a bid to build reputation for his service, as well as advertise the beauty of his hometown. "Foreign visitors often called me a ‘cowboy'. Some of them told me that during their trips in Bac Ha Plateau, they loved most of all the sound of horses' hooves on road and the tinkling bells on the horses' neck, which made me so happy," Chu said. Chu is the only one in the area who provides tourists with horse-drawn carriage rides. "I had to spend all my savings, worth VND60 million (US$2,800), to make my carriage. No one in the area dared to spend the sum as I did," Chu said. An admirer is a fan. A plateau is a flat area on top of mountainous country. Mountain landscape that is imposing looks grand and impressive. An impression is a feeling. Travelling the Bac Ha Plateau, tourists will be impressed with the colourful ethnic costumes, the horses' neighs, and the screams of mountain pigs intermingled with the sounds of hammers on the fires of blacksmiths. A neigh is the sound that a horse makes. Blacksmiths are people who make things like horse shoes, from iron. Horse straddling means riding a horse with a leg on either side of the animal. "My parents told me there were many horse carriages in my hometown during the years of French colonialism, from 1857 to 1945. The days of French colonialism in Viet Nam were when France ruled the country. However, such kinds of vehicles gradually fell into oblivion, and were changed over to modern vehicles. When something falls into oblivion it becomes unimportant. A horse's hooves are the parts of its feet made of horny material. "Yet, the carriage he made couldn't satisfy me because it was not convenient for carrying tourists," Chu said. If something is convenient, it fits in with the plans of others. "Yet, I ignored all the ridicule and continued making shoes and tintinnabula for my horse," Chu said. People ridicule others when they say things that make the others look silly. Someone's reputation is how others see them. 1. A flat area on top of mountainous country. 2. A place where people worship. 3. Another name by which foreign visitors often call Hoang Van Chu. 4. A country in Europe that once ruled Viet Nam. 5. The country where Hoang Van Chu bought his horse carriage. 1. Plateau; 2. Temple; 3. Cowboy; 4. France; 5. China.